The famous archaeological site of San José de Moro (SJM) located in the Jequetepeque Valley (JV) represents one of the best-preserved pre-Columbian Mochica cemeteries uncovered along the north coast of Peru. SJM was a regional ritual centre where elites and the general population of all JV met to celebrate ceremonial events. Its role as a place of regional integration and coordination continued long after the disappearance of the Mochica and SJM was continuously occupied throughout the Late Mochica Period (8th–9th c. AD) and into the Transitional Period (9th–10th c. AD). Even though the abandonment of Mochica traditions in SJM (funerary practices and ceramic styles) appears quite rapid, SJM was constantly occupied whereby local traditions were being reshaped. During this time various styles of ritual ceramics from different traditions (Mochica, Cajamarca and Wari) were buried within ceremonial and funerary contexts. 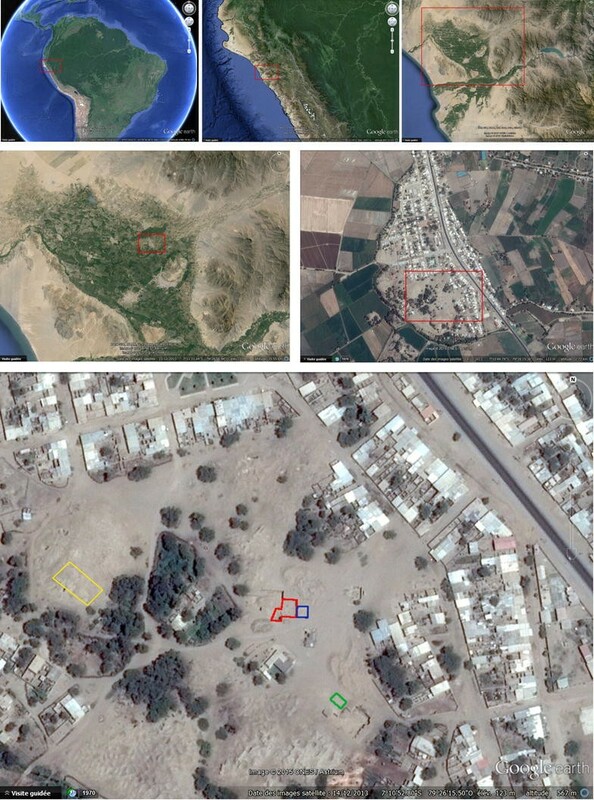 This research involves archaeometric studies of excavated painted diagnostic ceramic sherds representing four distinctive pre-Columbian typologies present at this site—Mochica fineline bichrome, Mochica fineline polychrome, coastal Cajamarca and Highland Cajamarca ceramics. For this study handheld portable X-ray fluorescence spectrometer (HHpXRF) instrumentation was operated in situ in order to (1) perform non-destructive trace element analysis (2) to assess if Cajamarca ceramics were further elaborated using the same raw materials employed by the Mochica potters of SJM, and (3) to establish whether or not Mochica and Cajamarca ceramics were truly technological markers in the lower part of the Jequetepeque valley. The chemical elements detected in the ceramic bodies by the portable technique and used for this analysis were: K, Ca, Mn, Fe, Zn, Ga, As, Rb, Sr and Y. All sherds that were identified as aesthetically different also differed chemically with the exception of the Mochica fineline bichrome and the Mochica fineline polychrome, which were produced in a coastal workshop using the same local raw materials. In addition, these sherds were not elaborated employing the same recipe used in the Coastal and Highland Cajamarca productions. Mochica ceramic productions are stylistically and chemically different from both Coastal and Highland Cajamarca productions. Ceramics from San José de Moro are technological markers of two cultures (Mochica and Cajamarca) in the lower part of the Jequetepeque Valley that interacted during Late Mochica and through the Transitional periods. The archaeological site of San José de Moro is one of the most remarkable pre-Columbian Mochica cemeteries in northern Peru and has been continuously excavated since 1991 by the Proyecto Arqueológico San José de Moro (PASJM) of the Pontificia Universidad Católica del Perú [1–5]. Tombs from this site have produced substantial discoveries of Mochica, Cajamarca and Wari ceramics in association with other artefacts (e.g. metals, semi-precious stones, textiles, etc.) within ‘elite’ and ‘non-elite’ funerary contexts throughout the Late Mochica Period (8th–9th c. AD) and the Transitional Period (9th–10th c. AD). The funerary evidence reveals a social scenario of intense inter-political interactions resulting in a sequence of events leading to catastrophic consequences . Archaeological data from SJM suggests local and non-local ceramics represent social and ethnic markers. The local technical ceramic traditions buried inside the funerary contexts of the Late period and represented in particular by the famous Mochica fineline painted vessels were possibly subject to technological modifications due to the influence of numerous foreign highland ceramic traditions and technical styles (i.e. Cajamarca and Wari) in the region. Using this research this hypothesis is now being first tested using an archaeometric approach (HHpXRF in situ research on Mochica and Cajamarca ceramics is in its infancy and uncommon). Some authors analyzed Mochica fineline bichrome, Mochica fineline polychrome and Cajamarca vessels separately and employed the use of various techniques such as SEM–EDS, cathodoluminescence, Raman spectrometry, X-ray diffraction and petrography [7–9]. This study involves the investigation of 56 ceramic fragments from four typologies commonly found for the Late Mochica and Transitional periods at SJM: (1) Mochica fineline bichrome (2) Mochica fineline polychrome (3) Coastal Cajamarca (4) Highland Cajamarca. The samples were excavated from three archaeological areas of SJM: area 47, area 49 and area 50 (Fig. 2). In area 47, layer 12 was excavated  and two Mochica polychrome fragments were identified. This deposit may be associated to the Late Mochica B occupation of the site (cf. [1, 11] for archaeological time spans for San José de Moro site). In area 49 layer 5 was excavated  and temporally associated to the Late Mochica B or Late Mochica C occupations by a single Mochica polychrome fragment and two Cajamarca Cursivo Floral sherds located in this layer. Finally, in area 50, several Cajamarca Cursivo Floral fragments of layer 4 were revealed . This layer may be associated to the late Transitional and even to the Early Lambayeque occupations of SJM. It is important to note that while archaeometric research on Peruvian Pre-Columbian ceramics is advancing [7–9, 14–16], the use of HHpXRF technique in situ is very limited. This is the first time that archaeological Mochica and Cajamarca ceramics materials from the Mochica site of SJM have been analyzed using this technique. At present, only one other study using HHpXRF analysis on Cajamarca materials at Huancabamba Valley (15th–16th c. AD) has been completed . Although in archaeology only 4% of publications cited using HHpXRF in an on-site-field-laboratory setting , it is ideally suited as an additional proxy for artefact processing at the archaeological site as a means to documenting large amounts of recovered objects (diagnostic ceramic sherds). On site field stations produce immediate feedback on the samples allowing the analyst instantaneous monitoring including any adjustments needed to the initial sampling strategy. Even though the advent of HHpXRF instrumentation has caused considerable debate within the archaeology community, elemental analysis is now firmly in the ceramic archaeologist’s lexicon, and even more now in 2016, HHpXRF systems have superior detector systems with the ability to accurately and precisely quantify the chemical composition of a range of ceramic materials incorporating the use of various factory calibrations and analytical protocols. The advent of HHpXRF should be seen as facilitating archaeological technology by eliminating the physical barriers between archaeology in the field and scientific analysis in the laboratory. With the emergence of HHpXRF in recent years, numerous authors have questioned the quality control of chemical analyses in archaeology and see it to be declining, most notably accuracy and precision. Several researchers have raised strong concerns against the wholesale acceptance of HHpXRF data as “the be-all and end-all” answer to a broad range of archaeological questions instead of targeting it to more appropriate cases where quantitative data should only be published when analytical uncertainty can be addressed through measures of precision and accuracy [18, 19]. Killick believes HHpXRF used directly on inhomogeneous materials such as ceramics produces inaccurate and imprecise data, and should not be accepted for publication . As a consequence, the HHpXRF based studies of ceramics presented at meetings and/or published are considered to poor science. Ultimately, the results from HHpXRF analyses must fulfill their own rules of validity and reliability, which is the baseline to good scientific research and this study. To answer these concerns of validation and sustainability, published research together with method protocols, raw data and other forms of supporting information is vital. An extensive review (200 papers) of portable XRF (pXRF) systems and Handheld portable XRF (HHpXRF) instruments in recent archaeology demonstrate that only 43% of pXRF journals actually use handheld instruments, and of these, over 80% of HHpXRF analysis is performed in laboratory conditions (university laboratories and museums), with only 18% being conducted at an excavation (15%) or on site in a field laboratory setting (3%) . Concerning the controversy over increased specialization and segmentation in archaeological practice [18, 21–25] the portability of HHpXRF has role to play that encourages bringing together scientific practice and archaeology. Investigation, analysis and interpretation need to be synchronized in the field and with common research objectives. This new approach to operating HHpXRF in the field is developing a new paradigm of new methods, theories and goals. The advent of the HHpXRF should be seen as facilitating archaeological technology by eliminating the physical barriers between archaeology in the field and scientific analysis in the laboratory. This paper’s focus is on pottery production at the pre-Columbian site of San José de Moro using this new non-invasive technique of chemical characterization. Two fundamental and central questions frame this research. The aim of this research is to answer both—Were Cajamarca ceramics elaborated further using the same raw materials employed by the Mochica potters of San José de Moro?—Were both Mochica fineline bichrome and polychrome painted ceramics produced using the same raw materials? Although Mochica and Cajamarca vessels from SJM are well documented aesthetically [3–5], there is no comparative information about the nature of raw materials used to produce San José de Moro Mochica and Cajamarca ceramics at the Late Mochica and Transitional chronological periods. This technique (HHpXRF) has been chosen in order to compare the chemical composition of the samples without damaging them and using only raw intensity data. 56 pottery sherds (n = 56) were chosen, attributed to and representative of four pre-Columbian typologies groups: Mochica fineline “bichrome” painted fragments (n = 37), Mochica fineline “polychrome” painted fragments (n = 6), Coastal Cajamarca fragments (n = 7) and Highland Cajamarca fragments (n = 6) (Figs. 1, 2). Archaeological site and excavations at San José de Moro in 2013 and 2014. On the last image, area 47 is red, area 49 is green and area 50 is blue. Yellow area was also excavated, however no representative ceramics were found. Site location and archaeological areas showed using Google Earth images. Now in 2016 many HHpXRF systems have superior detector resolution and electronics than laboratory-based systems of 5–10 years ago. Manufacturers have optimized their tube-sample-geometry; Bruker HHpXRF systems are configured with the tube and the detector at 64o angle with sample testing at the convergence of this angle. In current XRF engineering other portable or fixed-laboratory XRF systems use angles that range from 45o to 90o. With the miniaturization of electronic components, performance has vastly improved within the parameters of portable XRF systems. The manufacturers have created almost identical systems and repackaged the internal components (tube, detector, multichannel analyses) of portable bench-top systems into handheld configurations, the only difference being the packaging . A Bruker Tracer III-SD Handheld X-ray Fluorescence Spectrometer was used in order to identify the chemical composition of the ceramic bodies in situ. The archaeological samples were lightly brushed and cleaned with water before non-invasive analysis was performed. The HHpXRF Spectrometer was positioned upward so that the sample table sat horizontally (the X-ray beam vertically upwards) with the protective cover above (sample shield). It is important to mention that we faced just one analytical constraint: the analyses were performed in a field laboratory where the environmental conditions (i.e. temperature, humidity, etc.) were not the same constantly during the campaign. Regarding analytical parameters, analyses of heavier elements ranging from K to Y were performed whereby this methodology is favored and commonly used in archaeological ceramic research. The device uses a Rhodium target X-ray tube excitation source, a set of Palladium slits, 40 kV high voltage and 30 μA tube current. No vacuum was applied. A green filter composed of Cu, Ti and Al, was used for all analyses. Metered signals were collected from two to three separate unpainted sites from each sample (with the exception of BDX16316, BDX17166, BDX16340, BDX17164, BDX17165 and BDX16563 that had being analyzed just one time because of their complex geometries) over a period of 120s. For each sample raw intensity data (the number of counts) were normalized to 1 and exported from S1XRF (Table 2). Because the nature of this data is compositional, intensity data has been transformed using the centred log ratio (CLR) in order to project it in Euclidean space [26–28]. The CLR transformation is described in Eq. 1, where g(x) is the geometric mean of a D parts composition. Further statistical calculations were conducted using a fully cross-validated PCA using Past v2.17b Software Program . Contextual analysis is another important aspect in this methodology. The relationship of HHpXRF chemical analyses can add further structure to an understanding of the artefact in relation to its surroundings, and furthered with systematic studies of spatial patterning of the whole archaeological data. The concept of contact, exchange and dispersal is linked to regional scale distribution mapping; here HHpXRF methodology can construct and test theories such as central place theory and settlement hierarchies (particularly useful for regional chronologies in JV). The operation of the HHpXRF is new technique to distinguish geological sources and assign artefacts to them yielding valid archaeological (and not geochemical) data. Our results emphasize archaeological accuracy. Each sample was analyzed macroscopically in order to categorize the type of fragment (shape, body, form) and identified their aesthetic painted motifs and iconographies through comparison of handbook literature. For the classification of sherds handbook guides were employed—for Mochica ceramics, McClelland’s information was primarily used —for Coastal Cajamarca Bernuy and Bernal’s classification was employed —and for Highland Cajamarca, data from Terada, Matsumoto and Watanabe allow classification of these materials [31–33]. The results are presented in Table 1. The elements considered for HHpXRF analysis were: K, Ca, Mn, Fe, Zn, Ga, As, Rb, Sr and Y (Table 2). Primarily the study demonstrates Mochica fineline painted samples and Coastal Cajamarca samples have significantly higher FeKα1 signals in contrast to the Highland Cajamarca samples that returned significantly higher YKα1 signals. In addition, the Coastal Cajamarca samples returned a lower signal for RbKα1 than that of the Mochica fineline painted styles while displaying similar Sr concentrations. Both Highland Cajamarca and Mochica fineline painted samples presented higher signals for AsKα1 than of the Coastal Cajamarca samples. All the samples have similar ZnKα1 values. Were Cajamarca ceramics elaborated further using the same raw materials used by the Mochica potters of San José de Moro? The PCA plot (Fig. 3) demonstrates that Mochica fineline painted samples, Coastal Cajamarca samples and Highland Cajamarca samples can be differentiated according to their respective chemical compositions. In our corpus, we differentiate three separate chemical groups being: Mochica productions (black dots), Coastal Cajamarca (gray diamonds) and Highland Cajamarca (gray triangles). Were both Mochica fineline bichrome and polychrome painted ceramics produced using the same raw materials? Since Mochica fragments are the most abundant, a comparative analysis of ratios was the first approach employed for comparison. Two chemical sub-groups identified as SJM-1 and SJM-2 were principally detected. In the SJM-1 sub-group fragments showed a SrKα1/FeKα1 ratio of 0.12–0.25 and a RbKα1/SrKα1 ratio of 0.15–0.38. While in the SJM-2 fragments, SrKα1/FeKα1 ratio was 0.08–0.17, and RbKα1/SrKα1 ratio was 0.38–0.54. In order to compare all the Mochica fragments to ratify and confirm the presence of these two chemical sub-groups; a fully cross-validated PCA analysis considers all the chemical elements. The analysis of raw intensities data transformed (CLR transformation) inside this group (notably for CaKα1, SrKα1, RbKα1 and YKα1 data) demonstrates the existence of two chemical sub-groups that are not directly related to the bichrome or polychrome ceramics (Fig. 4). The chemical sub-group SJM-1 is represented by the black dots and the chemical sub-group SJM-2 is represented by the gray triangles. The sub-group SJM-1 consists of 30 sherds: 24 sherds of Mochica fineline bichrome and notably all of the 6 sherds of the Mochica fineline polychrome. In contrast SJM-2 group also included 12 fragments of Mochica fineline bichrome. A single sample (BDX16321) could not directly assimilate to one of two sub-groups by where SrKα1/FeKα1 ratio of 0.13 and RbKα1/SrKα1 ratio of 0.33 lies at the interface of SJM-1 and SJM-2. Notably in SJM-1, the Mochica bichrome painted samples and Mochica polychrome painted samples overlap and are indistinguishable. Both styles have Ca rich ceramic bodies quite likely produced in local workshops using mainly the same local raw materials , and elaborated without the same recipe used in the Coastal and Highland Cajamarca productions. The SJM-2 group is both aesthetically and chemically different from the Cajamarca ceramics. Currently, there lacks the data needed to distinguish whether this Mochica sub-group (SJM-2) was or not produced locally by San José de Moro potters. Each fragment was macroscopically investigated, identified and grouped. Following a nondestructive archaeometric approach, we engaged the use of HHpXRF spectrometry and performed chemical characterization analysis on all samples. Our results strongly support the aesthetic approach documented by archaeologists coupled with the HHpXRF technique in classifying all samples into the same three groups—Mochica, Coastal Cajamarca and Highland Cajamarca. Thus, in situ HHpXRF analysis further established that sherds identified as aesthetically different also differ chemically due to the use and combination of distinctive raw materials, with the exception of Mochica fineline painted styles. Even while Mochica and Cajamarca people were increasing the trade of artefacts and breaking the status-quo of cultural interaction, potters of both societies did not exchange raw materials: Coastal and Highland Cajamarca potters did not produced ceramic bodies using the raw materials exploited by Mochica potters. Mochica, Coastal Cajamarca and Highland Cajamarca ceramic of these periods are aesthetically and chemically different. Lastly, the specific analysis of Mochica bichrome and polychrome fragments showed the existence of two chemical sub-groups: SJM-1 and SJM-2. Both are not surprisingly related to the decoration and color aspects of objects. SJM-1 is the sub-group the most representative of the SJM site. In addition, if the Mochica fineline bichrome ceramic production could be classified as homogenous, Mochica fineline polychrome ceramic production was indeed standardized. All Mochica fineline polychrome ceramics were produce locally as well. With the correct research questions, a good methodology and an understanding of its parameters, HHpXRF is a valuable aid to an archaeologist’s on-site thought process. New methodologies in HHpXRF would open the way to formulate and test new theories regarding cultural, behavioural and intellectual aspects of our recent ancestors. HHpXRF theoretical approaches leaning toward space, context and material patterning will open new ways of collecting data in situ. NDS carried out the laboratory experiments. RC, LC, RJB provided support and guidance for this study. NDS, SK, RC, LC and RJB analyzed the data, interpreted the results and drafted the paper. All authors have contributed to, seen and approved the manuscript. All authors read and approved the final manuscript. We thank the IdEx program of the University of Bordeaux (France) and the cluster of excellence called “laboratoire des sciences archéologiques de Bordeaux: LaScArBx” (ANR-10-LABX-52).